I have been sharing my journey to get healthier and lose weight each month through reviewing my word of the year: Health. After faltering in February and falling back on junk food and bad habits, I decided that I was going to start doing two things, monitoring what I was earing and trying to learn as much as I could about health and healthy eating. The first thing I did was to get weighed properly. My own scales will tell you a different weight depending on where you place them. Of course I look for the spot where it shows the lowest weight. So when I got myself weighed by the machine at Boots (the pharmacy), my accurate weight was higher than I thought and my score on the BMI (Body Mass Index) was higher than it should be. I have been monitoring what I eat using the MyFitness Pal app on my phone. This allows me to log what I eat in a food diary (and how many calories this makes up) and also measures the number of steps I take, so that my exercise can be offset against my calories. I have found that monitoring what I eat has really raised my awareness of the things that I was eating that seemed small, but were making a difference to me losing weight (such as chocolate and fizzy drinks). Over the course of March, I have managed to wean myself off most junk food and snacking. My portion sizes have gotten smaller, I have stopped snacking in between meals and tend to have healthier foods. I am finding it easier to avoid sugary and fatty foods and snack healthily. Where I have fallen onto eating junk or too big portions, it feels like too much because my appetite has shrunk. It helps that my work is busy right now and I am not eating out of boredom too I think. What is also great is that when I do treat myself to chocolate I don't feel guilty at all, because the rest of my diet is so much better. I am still trying to drink enough water and I am finding I am still pretty bad at this. I tried adding lemons or limes to water and really liked it. The citrus fall apart after a while, so I have tried this bottle with a filter in (my green bottle in the picture is this one, which I really like). Something to keep working at. I have started to move away from a carb heavy diet to one with protein and much more carbs such as grilled or roast fish or chicken with lots of vegetables or salad. Sounds like basic common sense, but we are so used to a South Asian diet of chapatti, rice and curry, that this has felt like quite a departure for me in the way I eat. I found a lower calorie Asian snack in the form of gol gappay/pani puri which I thoroughly enjoyed. A treat from my mum - a keema paratha (chapatti stuffed with minced lamb) - definitely not low calorie, but enjoyed guilt free alhamdulillah. My current reading is Eat. Nourish. Glow. by Amelia Freer. I have found this accessible and easy to get through. The focus so far has been on cutting sugar, diary and gluten and increasing veg, healthy fats and protein. The writer admits that some of this might seem faddish, but believes strongly that these are the things that make a difference in our health. She offers some examples of foods that we should replace in our kitchen and things to shop for instead. I am just starting to look through the recipes and the jury is out on whether I think I would want to try them ( the cauliflower pizza with pesto - unlikely, the chicken nuggets with mango salsa, maybe). 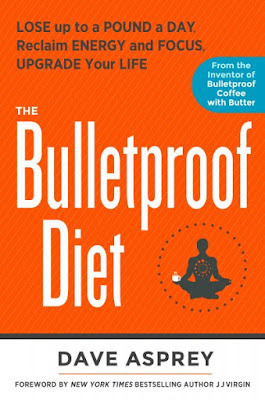 The other book I have been reading is The Bullet Proof Diet by Dave Asprey, the man responsible for "Bullet ProofCoffee" - I haven't gotten very with this one yet, except it seems to be fairly consistent with Eat. Nourish. 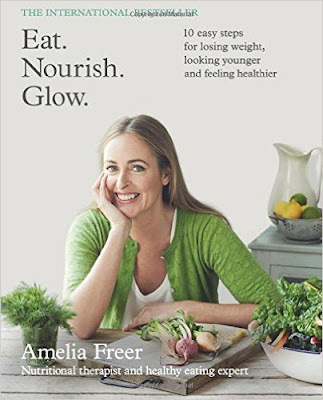 Glow in its messages around diary, sugar and gluten, and also funnily enough lentils - a staple food in our home that we are encouraged to eliminate by the book and which I have always viewed as a healthy food. I haven't gotten very far with this yet, but I am fascinated with the premise of the book, where the author has spent a great deal of money and conducted research to find the optimum way to lose weight. The upshot of all of this effort is that I have lost a few pounds. My kids have noticed because they see me without my abaya at home. I felt very happy and upbeat for a couple of days and could not figure out why, I suspect that the change in diet and daily walking played their part. It feels good to start seeing a change and helps me to feel motivated. so nice to hear you are doing well on your path to better health! Alhamdulileh, I'm making efforts too and it is going well. My mother has recently been diagnosed with diabetes which makes me even more motivated. Like your mother and her problems with her knees, which you wrote about in your other post: it impacts us when the health of our mothers deteriorates. Just one careful advice (I don't want to insult you by any means, my intention is to help): wouldn't it be wise to look at government recommendations of what a healthy diet consists of? I'm not sure which organisation writes about such information in your country (the NHS?) because I don't live in the UK. But usually that information is more in line with proper findings in science instead of the latest diet fads,such as avoiding gluten. For instance, the supposed problems with lentils goes against many sound research which claim it is very good for you, also when trying to lose weight. May Allah (SWT) give your mum shifa insh'Allah and keep her well. Thank you for the advice, I don't take insult at all and I am always grateful when sisters reach out with advice and good intentions/wishes. I've had a look at the NHS advice and it is comprehensive, but a lot of it I have picked up through my children's school and through the information given by the babies health visitors. Anything new I am learning or looking at certainly, I am looking at against the established information. Mashaallah you are so motivating! but agree with Maryam about health guidelines cuz there r so many theories on this out there..sugar is definitely bad but pulses? I think that is same like paleo diet-not supposed to eat dairy lentils beans chickpeas only some nuts eggs fruits and vegs..and meat, meat, meat I think that's not really affordable, let alone healthy. vegans on the other hand cut out everything animal sourced...just doesn't really make sense to me. but I think lentil is a super cheap suler healthy full of fiber food I actually love. I can still remember that phase of getting to 2pm and realising I am still in my night clothes because I have been busy with the babies. Insh'Allah it will definitely get easier. I know, that sounds odd to me, we used to joke when were kids that lentils are the Pakistani health food and I have always thought of them as super healthy, so curious what the book has to say.